The plan to travel by the B9R was hatched while I was heading to Thrissur from my home in Kodungallur. I was traveling to Thrissur to book my return ticket - and was confused if I should book on the Kerala SRTC or the Karnataka one. It was then that the B9R idea popped up.. I got down near KSRTC bus station, and walked straight towards a Kallada Agent. The office had a huge bannering announcing the introduction of B9R services. I book a ticket on the B9R - the agency charged me Rs. 800, and the seat provided was F3. The day arrived. I left home at 1845. I took a bus from Kodungallur at 1950, and the driver dropped me at Thrissur by 2050. The driver did not have to utilise much of his F1 skills, since the road was too empty for heroism. I had a pleasant ride on the bus. Thrissur had more or less closed down by now - most shops had downed their shutter. Just a few shops and a couple of restaurants remained open, catering to many passengers who were arriving at the Bus station. I had a short walk around at the KSRTC bus station - but found nothing much interesting. I walked out, straight to the travel agent's office. I reached the office at about 2105. He issued a boarding pass quickly and told me the bus's number. I asked him if the bus was on time - he immediately called up the driver and found out that there could be a 15 minute delay. There were no buses around the time, and quite a few passengers came asking for tickets to Bangalore. Soon, a Yathra travels bus to Bangalore came in. The bus was more or less full when it came in, and it picked up more passengers from there. At around 2150, my bus came in. There was one Kallada G4 volvo right ahead of my bus. The Brown-and-Gold sleek lady slowly took a short curve and came on to the travel agent's office. Four passengers were to join here. The doors were quickly opened and all of us got in to occupy our seats. My seat was F3 - an Aisle seat on the left side of the sixth row. I sat down, and turned back only to realise that I was approximately around the middle of the bus. The entertainment system in the bus had a 21 inch LCD monitor, and another drop down monitor just a row behind my seat. The drop down screen was not being used since only half the bus was occupied. A recent release Malayalam movie was being screened - the movie was close to getting over. The 13.8 metre whale started crawling forward at 2205 - 35 minutes past the scheduled departure time. The bus crawled past the city centre and continued its way past a city that was by now fast asleep. There was no pick up at their office at Thrissur By-pass. The other Kallada bus (a Volvo operated by Kallada G4) stopped at the place for a pick-up, while we continued a full force run ahead. The movie finished by around 2300 - the monitor was switched off, while the lights were all switched off now. I initially tried sleeping at my seat, but later decided to pick an empty seat at one of the last rows. I moved to the last-but-one-row, on to seat K4. This seat was right above the engine, and I could hear ever single grunt from the 9-litre monster sitting right below. The engine churns out a massive 340hp of power at 1900rpm. The engine puts out a stomach churning torque of 1632 Nm at 1200 rpm. The engine showed what it was capable of, every time the driver stepped on to the gas pedal. The engine responds instantaneously, and the bus just jets ahead. The driver did face some difficulties overtaking trucks in Kerala, due to continuous oppposite side traffic. The bus made a brief halt at the Kerala Sales Tax Checkpost at the border - the halt also doubled up as a tea break for the driver, and a leak break for passengers. We continued on towards Tamilnadu - the run was slow, with roads in a bad condition across the border. The bus stopped at the Incoming RTO check post - the assistant ran with the papers, got it checked and rushed back. The driver got into form, and we had a brilliant run from here on. The bus rushed past the by-pass junction and entered the by-pass road. The halt at the first toll-gate was smooth. The bus came down to the halt, without any jerk inside the bus. We crossed the speed breakers - and all that was felt inside the coach was a small disturbance. The driver crossed the toll gate and we continued out run ahead. The feel inside was as if the bus was crawling, but the distance covered clearly identified that we were cruising at a pretty good speed. About half way through the by-pass road, the driver stopped near another Kallada bus. The bus - a non-AC semi-sleeper bus - had broken down in the middle of no where. 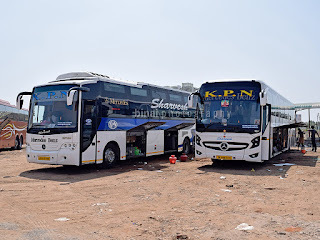 The passengers were immediately offered seats in our bus - a very good initiative considering the fact that ours was the top-of-line offering by Kallada. The move, however, is a disgrace to paying passengers - Kallada charges a premium over the normal Volvo. The "rescue" meant a detention of about 20 minutes. Quite some luggage from that bus too was dumped into the under-carriage baggage space in our bus. The driver was now back into business. I adjusted my seat slightly, and got into a comfortable position to sleep. I fell asleep instantaneously. The Airconditioners were set to lighter temperatures - it was getting hot inside the coach before the compressor kicked in again. The ride was comfortable - the engine's grunt provided a well needed lullaby to my sleep. I woke up as the bus pulled into a fuel station at Perundurai - on the outskirts of Erode. The bus filled up about 230 litres of diesel here, while many passengers emptied their tanks there. There was a sole tea-coffee vendor at the fuel station, who also stocked up some biscuits and buns. Our bus was accompanied by the Yathra bus that left from Thrissur 30 minutes before us, and a Kallada Sleeper bus. The halt was about 15 minutes long. Government operators and some private operators stop at proper motels for break, so that passengers could stretch out a bit while also having some refreshments. The 15 minute break was optimally utilised to snap some pics of the bus. The cleaner came around to check if everybody was in and then signalled the driver to start. We started after the break at 0145. 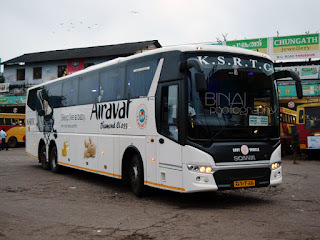 The bus ran on the highway for some more distance, before taking a deviation to Bhavani. 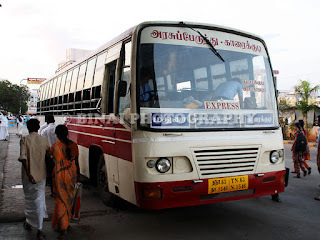 Private operators operate via Perundurai-Bhavani-Mettur-Dharmapuri, instead of the conventional Perundurai-Sankari-Salem-Omalur-Dharmapuri route of government buses. The former is about 16 kilometers shorter than the latter, and also has lighter traffic. The initial stretch of this route (Bhavani-Mettur) was not very good. The roads were too narrow, and some turns were too tight. I dozed off a while after the bus entered the stretch. When I woke up, we were somewhere near Toppur. The bus had stopped at a way side stall for yet another break. I dozed off again as the bus moved out of the stall. The AC was very effective now, and I pulled over the woolen shawl provided by the operator now. I had yet another deep slumber as the bus moved ahead. I woke up as the bus was approaching Hosur. The time was close to 0530 now. I then noticed that my spectacles were missing - I had left it in my shirt's pocket. It perhaps fell down during a sharp roll. I searched around for a while, and found no trace of the spectacle anywhere. The bus crossed Hosur bus station just around 0600. The driver picked speed after Hosur. We were flagged down by a sales tax guy at the Karnataka Check post (The Karnataka government office at Attibelle). The bus just slowed down, and was then allowed to proceed. My pursuit for the spectacles continued. We crossed Electronic city, and the bus continued its run towards the city. The bus stopped at Bommanahalli (the place where I usually get down) while I just spotted my spectacles lying right below the seat right behind mine. I was perplexed as to how it landed there... my stop was gone and I decided to continue on to Madiwala in any case. The bus pulled into Madiwala at 0640. Auto drivers swarmed the bus like every time. I took some photos of the bus, and some buses standing around. Then walked straight towards St Johns Hospital bus stop, and got into a bus heading towards my destination. I was finally at home by 0700. The 447-kilometre journey took about 8 hours and 35 minutes - a decent time considering the time we lost at the three breaks that the bus took. Although the premium charged for the service is not justified, the bus is surely the future of road travel in India. The ride is very comfortable and jerks are very much restricted in the bus. One very important - and interesting - feature that I felt was the effectivity of the retarders. Passengers remained at their seats even as the bus braked hard, unlike the B7Rs where the passenger feels a forward pressure. Your blog is really cool.!! By the way i'm very much curious about the mercedes benz bus. Any idea of travelling in that? Sofiya Lines reaches much earlier than 10. This bus reaches TVM by 10 AM. I have travelled in Sofiya Lines Multiaxle from Blore to TRV. Bus left at 7:00 PM and reached TRV by 7:15 am. I have travelled in Sofiya Lines Multiaxle from Bangalore to Kollam. Bus left by 7:30 PM and reached Kollam by 6:15 am. It was an Awsome drive.They are charging 950 with free food in a very good hotel. Check out the new SRM multi-axle volvo from TVM- BLR. It leaves ALP by around 9:10pm and reaches bangalore by around 6:15am. It's simply awesome. The speed rating is as follows 1. SRM 2 . Sofiyalines 3. KeralaSRTC Volvo 4. others( like shama, kallada and all). I take the train. After traveling Bangalore - Kerala for the past 8 years, railways are the best bet.